Often photographers are asked to “stop action” for a shoot. This could mean anything from “freezing” water droplets, stopping dancers mid-air in a jump, or tennis players mid-swing outside in full sun. All of the aforementioned scenarios can use a different flash duration, and depending on the Mono-head or Flash System (power pack and head), some fair better than others. This article basically concentrates on how to read, relate and understand exactly what information manufacturers are publishing by looking at a spec sheet. Lastly, there are some samples to prove that you can “freeze” action at 1/10th of a second shutter speed as well as a cameras 1/160th sync speed. 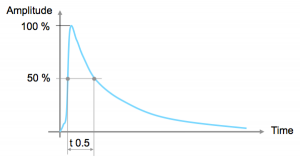 So…exactly what is flash duration and how does one interpret manufacturers spec sheets? To establish a comparison of technical specs, there HAS to be apples–to–apples comparisons and this is done through standardization. The International Standards Organization (ISO) has decreed that through the ISO 2827 for Photography / Electronic Flash Equipment, there is a Standard of Light Output and Performance, known as Flash Duration. Flash Duration by its simplest definition is the amplitude (or power), measured over time as seen in Table 1, and there are different times that the amplitude is measured. ISO-2827 states there is a flash measuring calculation of t0.5 and t0.1, where t0.5 is the Effective Flash Duration and t0.1 is the Total Flash Duration. Table 2 shows the t0.5 measurement and it is 50% of power within the overall duration of the flash. The real measurement that photographers should be studying is the t0.1 number and that is the Total flash duration at 10% of the overall duration as illustrated in Table 3. What can get confusing is the t0.5 measurement and how it stacks up against t0.1. If Tables 2 and 3 above were married for comparison, they would look like Table 4, where the t0.5 and t0.1 measurements are combined. 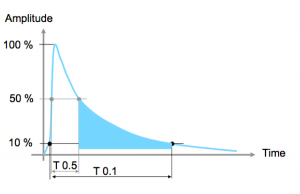 In Table 4 below, the blue shading shows the amount of duration not calculated within the t0.5 specs. This means that there is still a fall-off of power while the strobe head and capacitor are being discharged. Manufacturers want to put their best foot forward for their products, and why not? Just make sure you are reading ALL of the information and not just some snippets of data. Manufacturers are not going to publish false data but they could always include just a little more. Below are some screen grabs of published spec sheets where some list minimum and maximum power of both t0.5 and t0.1. Ok, now you understand the t0.5 and t0.1 settings, so how does flash duration and shutter speed relate to stopping action? 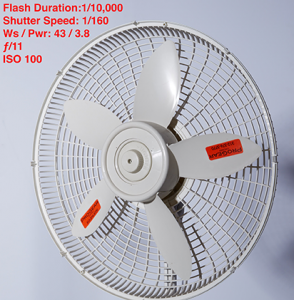 Simple, flash duration controls the freezing action and shutter speed controls the ambient exposure. There is a caveat to the previous statement that will be pointed out to the reader. Image 1 shows a high power setting of 7.0 (400Ws) which brings the flash duration to 1/1870th of a second. The shutter speed on the camera is 1/4 sec. 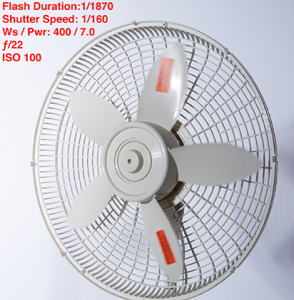 Note the fan blades are “transparent” and the background has a warm colorcast. This means there was an initial flash at a very low duration (blurred blades) and some residual exposure on the end of the flash duration causing the color. 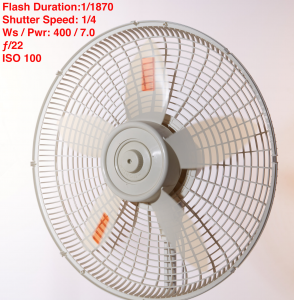 Image 2 shows the exact same shutter speed but at a lower power, thereby decreasing (shortening) the flash duration which then “freezes” the fan blades. One should note that if there are any other objects in the image that require stop-action, and lit with a different flash head, the same parameters for power must be met. Image 3 is now set at 1/160 sec taking out any ambient influence of light. 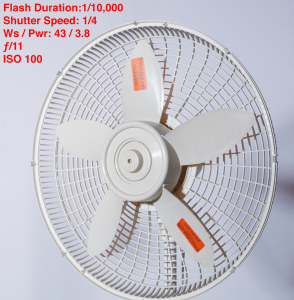 This illustrates the effect of a high power at a normal flash sync speed, which does not allow stopping motion. To combat this, refer to image 4. 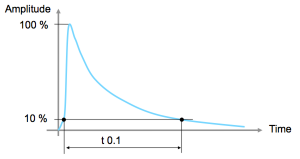 Image 4 illustrates fast flash duration with normal sync speed and the trade-off is less power. Combat the trade-off by opening the aperture or raising the ISO. In general, if you do a little research and read into the spec sheets provided by the manufacturer you will be able to achieve your goal for stopping action. The best advice is to rent some gear and try before you buy. Many rental houses that are dealers will allow a substantial discount, if not refund, of the rental based on the purchase. At the very least, talk to your local rental house and get some advice on what they recommend for the job you are shooting.